WEST COLUMBIA, S.C. -- A longtime Lexington 2 board member will be sworn in this month as president of the National School Boards Association. ElizaBeth “Beth” Dickerson Branham will become the first South Carolinian to hold the office when she is sworn in during the organization’s annual conference March 30-April 1 in Philadelphia. The NSBA advocates for public education and represents more than 90,000 local school board members across the United States. Branham started her career as an educator, teaching English at Brookland-Cayce High School. She later earned a law degree and today has her own practice in West Columbia at Beth Branham Law. In addition to serving on the Lexington Two school board since fall 2000, Branham has served as president and a member of the board of directors with the South Carolina School Boards Association, and is active with a number of other education, community and business organizations. Her most recent roles with the National School Boards Association were as president-elect and as secretary-treasurer. "Beth and I have worked together for many years on the Lexington Two school board, and I can honestly say her passion for education comes through in everything she does," said Lexington Two Board Chairman William H. "Bill" Bingham Jr. "I expect that same passion in her role as NSBA president, as she advocates for public schools, teachers and students across the country." 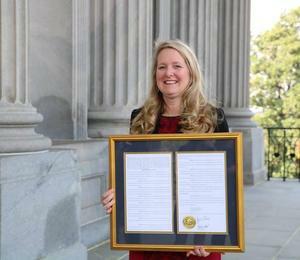 Branham was recognized March 21 at the SC State House for her newest leadership role with the national organization. Branham holds a bachelor’s degree in English from Boston University and a law degree from the University of South Carolina. She and her husband Keith Branham, who live in West Columbia, together have four children.